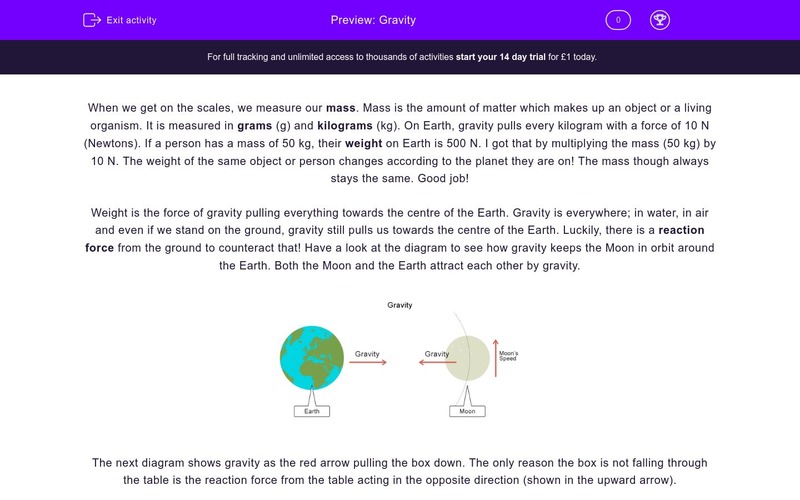 In this worksheet, students will learn about gravity in our life and how mass is different to weight. When we get on the scales, we measure our mass. Mass is the amount of matter which makes up an object or a living organism. It is measured in grams (g) and kilograms (kg). On Earth, gravity pulls every kilogram with a force of 10 N (Newton). If a person has a mass of 50 kg, their weight on Earth is 500 N. I got that by multiplying the mass (50 kg) by 10 N. The weight of the same object or person changes according to the planet they are on! The mass though always stays the same. Good job! Weight is the force of gravity pulling everything. Gravity is everywhere; in water, in air and even if we stand on the ground, gravity still pulls us towards the centre of the Earth. Luckily, there is a reaction force from the ground to counteract that! 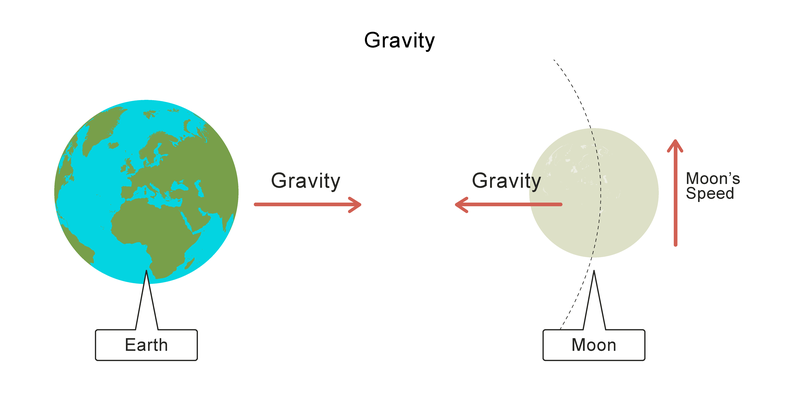 Have a look at the diagram to see how gravity keeps the Moon in orbit around the Earth. Both the Moon and the Earth attract each other by gravity. The next diagram shows gravity as the red arrow pulling the box down. 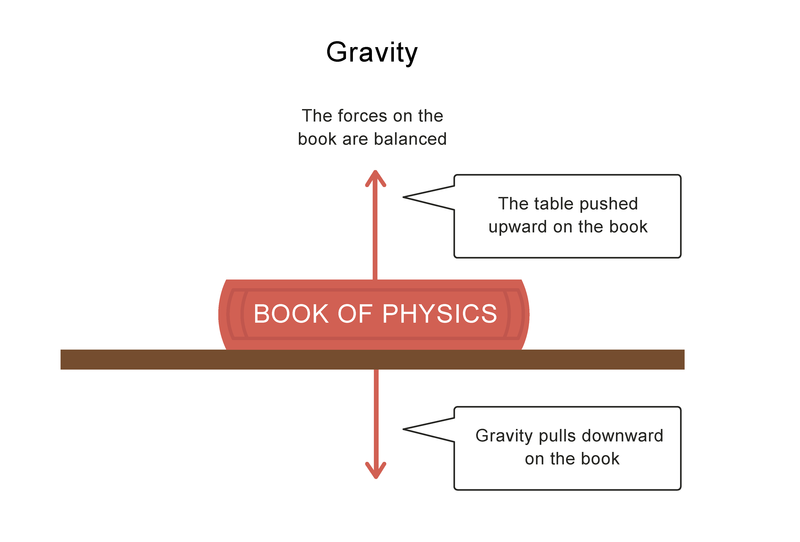 The only reason the box is not falling through the table is the reaction force from the table acting in the opposite direction (shown in the upward arrow). What is the unit for measuring mass? Two answers are correct. If an object has a mass of 4 kg, what is its weight on Earth? There is no gravity in the sea. Where does gravity pull us to? What is the force that prevents gravity making everything fall? What is the weight of an object with a mass of 7 kg on Earth? Mass is the amount of matter things are made of. Weight is the force of gravity pulling everything. Mass is measure in g and kg. Weight is a force, so it is measured in N as all forces. This is false. Gravity is everywhere! Gravity on Earth pulls us towards the centre of the Earth. Reaction force prevents gravity making everything fall. Gravity keeps the Moon in orbit around the Earth.